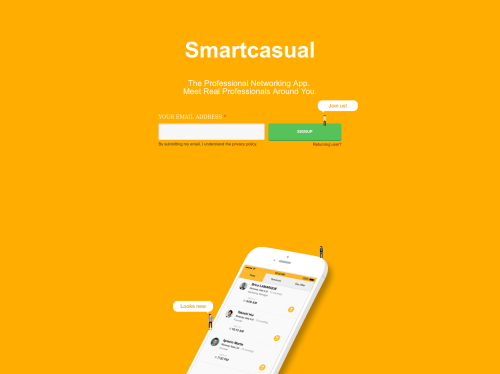 Smartcasual lowers the barrier for business networking. We display all the professionals around you available for a meeting over the next 3 days, along with their LinkedIn profile information. Find someone you would love to talk to? You are only 2 clicks away from meeting with him! Have a bit of free time and willing to meet someone new to hire, to work for, to work with or just to discuss with? Make yourself available on the app so professionals around you can request a meeting! With SmartCasual, your next meeting with the right professional is only 2 clicks away, so you can focus on what truly matters.